Even though you'll never run out of things to do in LA, the city is beautifully situated to explore the riches of Southern California and—with LA's driving culture—a road trip is just part of the experience. Whether you live in Los Angeles and are looking for a quick escape, or you are traveling to LA and want to explore a little more of California, here are some popular road trips that can be done as a day trip or as an overnight getaway from LA. Beach options along the coast are abundant, but within one to three hours of Los Angeles, you can retreat to the mountains or desert, explore wine country, experience California history or immerse yourself in mineral springs. Most of these road trips and getaways presented in the next pages are worth spending a night or two if you have the time and money, but if you don't mind long days and lots of driving, you can do every one of them as a day trip. Depending on who you talk to, a visit to Santa Monica, Pasadena, Long Beach or Disneyland may be considered just another day out in LA, a day trip away from LA, or reason enough to get a room and stay overnight. The distances we've listed are calculated from Hollywood, just to pick a central point. Given the size of LA, the distance could vary by 40 miles, depending on where you're actually starting. The travel times are off-peak driving times, which can be double or more in rush hour traffic. The trick to making most of the more distant locations as a day trip is to start before rush hour so that you're outside of LA before traffic gets jammed. The estimated times posted are for taking the quickest route, but sometimes it's worth taking the scenic route and enjoying the drive. It is a road trip, after all. 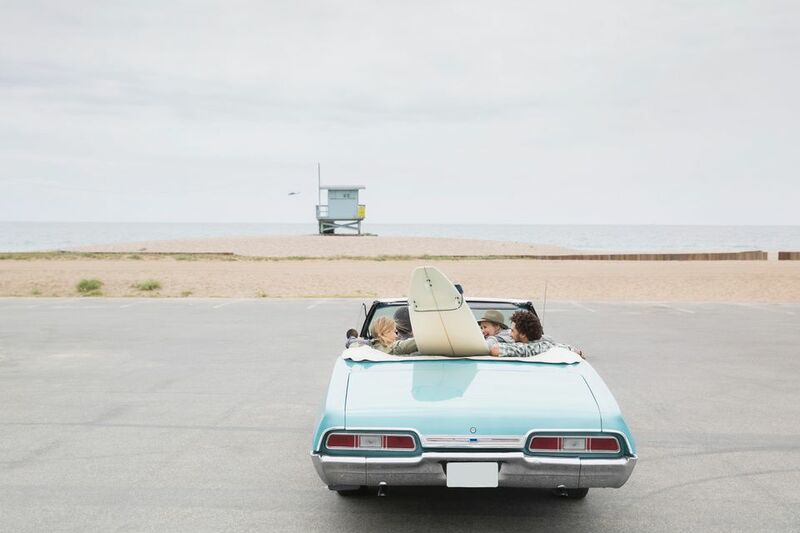 If you want to take a drive for the joy of driving, ​Malibu is a great place to start. The city stretches 27 scenic miles west of Pacific Palisades in LA along the south-facing coast at the edge of the Santa Monica Mountains to the Ventura County line. Most of the city is along both sides of Pacific Coast Highway, with access roads that cut through canyons or over mountains to reach State Route 101. The windy mountain roads lead to a number of surprises in the hills, from a stunt ranch and the Biggest Loser Resort to an elaborate Hindu temple. The Malibu Hills are also home to a number of ranches where you can go horseback riding and vineyards where you can take a Malibu wine tasting tour. The wealthy folks in Malibu don't really appreciate tourists, so there are only a handful of places to stay in Malibu itself. At the high end, the Malibu Beach Inn puts you right in the sand with waves crashing under your balcony. Malibu does have one of the few places you can camp near the beach at the beautiful Leo Carrillo State Park. There is also camping at Malibu Creek State Park, closer to LA, which is technically in the city of Calabasas on the other side of the mountain. There are 20 named beaches in Malibu, each with a different personality. Most of them are good for surfing. Some, like Matador, require a hike down to the water, but you're rewarded with gorgeous scenery. Several are just a scramble down a few feet of sand next to Pacific Coast Highway. Others, like Zuma, are long stretches of nondescript sand with good surf breaks, parking, and amenities. Things to see along the way include The Getty Villa, The Adamson House and Malibu Lagoon Museum, and The Weisman Museum of Art at Pepperdine University. Ojai (pronounced Oh' high) is a small town nestled among oak trees and orange groves in an east-west inland valley in Ventura County, about an hour and a half north of Los Angeles. It's another popular destination for a spa retreat or romantic escape. There are multiple destinations with accommodations and day spas, a cute little Spanish-style downtown to explore, nearby trails to hike, and boating or bird watching at nearby Lake Casitas. Santa Barbara is doable as a day trip from LA and it's not uncommon for people to drive up just for lunch or dinner, but it's more enjoyable as a weekend road trip. Santa Barbara is an upscale community with a uniform red-tiled Mission architecture as mandated by city ordinance. It's most popular as a romantic destination, with lots of places to stroll along the beach, or as a girlfriends' shopping getaway. Beyond the beach, there aren't a lot of family attractions. The most popular things to do in Santa Barbara are going to the beach, explore State Street shops and visit the Santa Barbara Mission, one of the oldest in California. You'll pass the beach cities of Oxnard, Ventura and Carpinteria on the way to Santa Barbara, which all have nice beaches, and more economical accommodations, but they don't have the same charm as Santa Barbara. What that stretch of coast does have is the greatest concentration of places to go camping at the beach. If you want to get even further away from it all, you can take a side trip to Channel Islands National Park, a group of five islands off the coast of Ventura, accessible by boat or small plane from Santa Barbara. There are primitive campgrounds, but no concessions on the islands, so take enough water and food for your day trip or camping needs. Outfitted trips are available. Solvang is a little bit of Denmark plopped in the middle of the Santa Ynez Valley about 45 miles northeast of Santa Barbara. It would be just about a two-hour drive without traffic, but is often closer to two and a half hours or more from LA. The city was founded in 1911, but it wasn't until 1946 that the community mandated that new construction adhere to the aesthetic of Scandinavian half-timbered architecture. Visiting the town now, it looks a lot like wandering the streets of a European village—with just as many touristy souvenir shops. To learn more about Danish culture and the Danish roots of the town, visit the Elverhoj Museum. There's also a Hans Christian Anderson Museum in the upstairs of the Book Loft. The town is surrounded by the vineyards of the Santa Ynez Valley, many of which have tasting rooms in town. Other curiosities in the area include the miniature ponies at the Quicksilver Ranch and OstrichLand USA Ostrich farm or take a private tour of Mendenhall's Museum of Gasoline Pumps and Petroliana in nearby Buellton. There's also a casino at the nearby Chumash Indian Reservation. The hotel and spa at the Chumash Resort get good ratings, but if gaming is your primary getaway goal, there are better places to go near Palm Springs, San Diego, or Temecula. The two most popular mountain destinations from LA are Lake Arrowhead and Big Bear Lake. They are only about 25 miles from each other, so if you're going overnight, you could do both. Lake Arrowhead is closer to LA than Big Bear Lake. The town is smaller and quieter, and many people find its half-timber alpine architecture prettier than Big Bear's more rustic vibe. However, there is less access to the lake itself, as the entire lakefront is private property. For the visiting public, the Lake Arrowhead Resort and Spa has a restaurant overlooking the lake, a small beach, and boat tours and fishing charters in the summer. Resort guests also have access to the Lake Arrowhead Golf and Country Club at the north end of the lake. In theory, there's a public trail around Lake Arrowhead, but visitors should be prepared to show their room key when hiking around the lake. The Village is a shopping area with a variety of boutiques and outlet stores. They also operate the Arrowhead Queen lake tours on a riverboat and a water-skiing school. During the summer, they host a series of free concerts, and in the fall they have a free Oktoberfest (the more famous one in Big Bear charges admission). There are other accommodations in town including the Saddleback Inn, which offers private cabins, a couple B&Bs and an abundance of vacation rentals, including some large enough to host a family reunion or staff retreat. The nearest ski resorts to Lake Arrowhead are about 14 miles east on Highway 18, about halfway between Lake Arrowhead and Big Bear Lake Village: Snow Valley for downhill skiing, and Rim Nordic for cross country skiing and snowshoeing. Big Bear Lake is more developed than Lake Arrowhead, with a lot more recreational options and—usually—more affordable accommodations. The Village at Big Bear Lake is more California mountain rustic than its neighbor, although it has a little of that too. It's still very walkable. Big Bear is a year-round destination. It's LA's most popular ski escape in winter, with the highly rated Snow Summit just minutes from town and the nearby Bear Mountain offering the biggest beginner and teaching ski area around. Big Bear also has an abundance of summer fun from water sports to hiking, ATVing, and zip-lining, making it a better family destination than Lake Arrowhead. Housing options range from tent camping to cabin or condo rental to lodges and resorts, so you can plan a getaway for any size group on any budget. Palm Springs has been a very popular getaway spot from LA since the days when early movie makers used the desert oasis as a set for shooting westerns in the 1930s. You can still see some old west movie sets on a Red Jeep Tour, however, the mass of Mid-Century Modern construction in the 1950s and 60s is more what defines the city's unique look today. Bob Hope, Frank Sinatra, and Dina Shore had iconic Desert Modern estates built in the area. Taking a guided tour or using the app or map for a self-guided tour of the modernist architectural landmarks is a popular activity. Every February, the city host a celebration of its architecture during Modernism Week. You can also take a jeep tour, hummer tour or sunset tour of the San Andreas Fault out in the desert or the San Gorgonio windmills. Many tours depart from neighboring Palm Desert. Many people go to Palm Springs to just hang out by the pool at their resort hotel and don't really care about doing much else other than finding an interesting place for dinner, of which there are plenty. Resorts are surrounded by manicured golf courses and tennis courts, so you can stay busy without wandering out into the town or the natural environment at all. Taking the Aerial Tram up to the top of the San Jacinto Mountains is the most popular attraction in the area. The temperature drops drastically from the desert floor to the mountaintop. In winter it might be 60 degrees at the bottom and snowy at the top. If you want to explore the desert, Indian Canyon is a good place to start. You can explore on your own or take a combination jeep and hiking tour. You can also tour the Palm Springs Wildland Preserves, take a tour that visits a wolf sanctuary or takes a 20-mile bike tour along the San Andreas Fault zone. If you'd rather admire the latest fashions and contemporary art than the local flora and fauna, you can take an insider tour of the area's best shopping and art galleries. The Palm Springs area is home to a number of casinos. For a really unique Palm Springs luxury getaway, you can rent Frank Sinatra's house, Twin Palms, a 4-bedroom Mid-Century residence with a piano-shaped pool that still includes original modern furnishings and memorabilia. The house is also available for weddings, corporate events, and private dinner parties. If you're in town with a group of 20-45 people, you can schedule a private tour. Joshua Tree National Park, with its iconic desert "trees" and enormous boulder formations is a Mecca for rock climbers and hikers. In spring the wildflower enthusiasts descend. Camping is the most common way to experience the park, but there are a number of hotels, bed and breakfasts, and vacation rentals in the town of Joshua Tree and nearby Twenty-Nine Palms. If you're looking for a day of relaxation, a day away at Glen Ivy Hot Springs could do the trick. Built on a natural mineral spring near Corona, CA, the 11-acre spa offers a variety of experiences included in their day rate from mineral baths to mud pools and fitness classes, so you could spend the entire day without ever scheduling a treatment. If you do want a massage, facial or other individualized therapy, it's best to book in advance. Most people do Glen Ivy as a day trip, since there's no hotel on the premises, and it's just over an hour from LA, but there are hotels nearby if you want to make a weekend of it. It can get a bit rowdy with bachelorette parties and bigger crowds on spring and summer weekends, so It's most relaxing on a weekday or in midwinter when it's less crowded. It's a desert area, so it's pretty hot in summer, but can still fill up on weekends. Temecula is one of those places you definitely have to go to on purpose because it's not on the way to anywhere else you're likely to be going (although you can take a day tour from Palm Springs). For oenophiles, the big draw is the Temecula Valley wine country, with over 30 vineyards, most of which offer wine tastings. The scenery is beautiful, and wonderfully photogenic, especially in the fall. The Temecula Olive Oil Company offers Olive View Ranch tours a couple Saturdays a month by reservation, or you can stop by their tasting room in Old Town any day to sample fresh California extra-virgin olive oils and flavored vinegar. In Old Town, where new architecture matches the original old west buildings, you'll also find cute boutiques, specialty shops and restaurants, a lively community theater and a jazz club. The Pechanga Resort and Casino is another big draw in the area. The AAA Four Diamond resort, owned by the Pechanga Band of Luiseño Indians, is the largest casino in the Western US, offering slots, blackjack, poker, craps, and roulette 24/7. If you're not gambling, you can still spend a day at the spa, play a round of golf at the Journey at Pechanga golf course, enjoy big-name entertainment in multiple venues and dine at 10 different eating establishments. There is also an RV Resort adjacent to the casino. Other popular activities in Temecula are hot air ballooning and horseback riding or playing the six championship golf courses. For beer-lovers, there are also four breweries in the area. Temecula hosts an annual Balloon and Wine Festival at the end of May or beginning of June, as well as numerous other music, arts, food and wine festivals throughout the year. Like the northern LA County Beaches in Malibu, the southern beaches in Orange County are more geographically scenic than the long straight stretch through Huntington Beach and it feels more like a getaway the farther south you go. Unlike Malibu, most of the local beach cities also have tons of shopping, nightlife, boat tours, beach butlers and lots of hotels and resorts. If you were starting at LAX, you could drive along the small coastal roads through the South Bay Beach Cities, around the Palos Verdes Peninsula, through San Pedro, across the ports of Los Angeles and Long Beach, through Long Beach, then back to Pacific Coast Highway to the Orange County beach cities of Huntington Beach, Newport Beach, Laguna Beach, Dana Point and San Clemente. It takes a couple hours, but it's scenic, and you see parts of LA most locals never do. However, if you're starting in Hollywood or Downtown LA, it makes a lot more sense to hop on the freeway, and you can be there in just over an hour. By freeway, it takes about the same time to get to any one of the Orange County beaches down to Dana Point, since you're dropping in on them from above. Driving along the coast, it can take a half hour to an hour to get from Huntington Beach to Dana Point, depending on traffic. Huntington Beach is the northernmost beach. Surf City, USA has more working class roots than beaches farther south, but it has added a number of upscale gastropubs and fine dining establishments to offset the surfer bars. If you just want to experience that laid-back surfer lifestyle, you'll find it in Huntington Beach, and it may be more affordable than the more southern beaches. Next is Newport Beach, a 10-mile stretch which is both very affluent and densely populated. It has some of the county's best high-end shopping at Fashion Island, as well as unique boutiques along Pacific Coast Highway. They also have some of the best waves for pro surfers near the pier. Within the embrace of the Newport, Peninsula is a couple of islands accessible by bridge or ferry that are primarily residential, but Balboa Island has a strip of cute shops and restaurants. There are year-round gondola rides around the channels and during the holiday season, special boat tours of the Christmas lights, as well as multiple nights of Christmas boat parades. With the limited road access to the islands and the peninsula, driving and parking can be a real challenge during the summer. At the southern end of the city, Crystal Cove State Park stretches into Laguna Beach, It is a popular spot for tide pooling on the beach side, and hiking into the hills on the inland side of Pacific Coast Highway. For the entire summer, it's taken over by Laguna Beach art festivals—three of them at once—and the Pageant of the Masters living pictures production. The rest of the year it still has the most scenic beaches, an exceptional number, and range of art galleries, great restaurants, and nice hotels. For those who like to meet the artists, Laguna Canyon road is lined with artist studios and workshops, some of which are open to the public. South of Laguna is Dana Point, a small town with a harbor deep enough to host three tall ships, two of them at the Ocean Institute. The big draws in Dana Point are the 5-star accommodations at the Ritz-Carlton Laguna Niguel on Salt Creek Beach and the Monarch Beach Resort, adjacent to the Monarch Beach Golf Links. Both Newport Beach and Dana Point are famous for their whale watching excursions, which Dana Point celebrates with a Festival of Whales the first two weekends in March. South of Dana Point, Capistrano Beach sits below the town of San Juan Capistrano, separated from a high bluff by the Coast Highway. The beach itself is a narrow strip of sand between the parking lot and the water. Mission San Juan Capistrano is a pilgrimage destination for fans of California and Catholic history, as well as the famous swallows that return every spring. The Mission has a special prayer room within the Serra Chapel dedicated to Saint Peregrine, the patron saint of cancer sufferers. San Clemente, the southernmost Orange County beach, has the distinction of being the only one where the Metrolink or Amtrak trains let you off steps from the beach. You can take a train from Union Station in Downtown LA and be on the beach in San Clemente in an hour and a half. San Clemente State Beach also has a campground, so despite the high property values of those Spanish-style homes, you can actually have a very economical getaway to San Clemente. The town has an even more small-town laid-back vibe than Huntington Beach. Carlsbad is a beach town 95 miles south of Los Angeles, now most famous for being the home of LEGOLAND, CA. It was named for the mineral water discovered in 1882, which had a similar mineral composition to the healing waters of what was then Carlsbad, now Karlovy Vary in the Czech Republic. The mineral water spa was a popular attraction during the depression when it was abandoned. The well was re-drilled and the ​Carlsbad Mineral Water Spa finally re-opened in 1996. It is a California Historic Site as well as a full-service day spa, but it's not why most people head to Carlsbad. Families with young children flock to Carlsbad to visit Legoland, a LEGO-themed park with rides and attractions, including special winter-only rides. The Legoland Resort includes two water parks and the Sea Life Aquarium. Adults go to Carlsbad to shop the Carlsbad Premium Outlets, as a dedicated trip, or on the way to San Diego, and seasonally to visit 50 acres of cultivated flower gardens at the Flower Fields at Carlsbad Ranch. It's also a nice beach getaway with nice hotels, good restaurants and a beautiful beach with free parking. Downtown Carlsbad is cute to walk around. If you're staying in town, an excursion to the Craftsmanship Museum of miniature model engineering, the Museum of Music Making, or the GIA gem museum could add a little diversity to your trip. La Jolla, as its name implies, is the jewel of the San Diego coastline. The affluent northern neighborhood in San Diego has seven miles of waterfront, including the city's three most scenic beaches: La Jolla Cove, La Jolla Shores, and Windansea. The northernmost beach, La Jolla Shores, is a long stretch that merges with Torrey Pines State Beach. It is the most coveted spot for walking, running or lying in the sun, but can be very crowded. La Jolla Cove is surrounded by rocky cliffs and has limited sandy area, but is great for exploring the tide pools at low tide and is the best beach for snorkeling or scuba diving. Windansea is a popular spot for more advanced surfers with hard-breaking waves close to shore. La Jolla has an abundance of unique shopping, top restaurants, and scenic walks as well as an award-winning theater, one of the top arts festivals in the state and free summer concerts. San Diego is a couple hours south of Los Angeles. There are certainly enough attractions in San Diego to fill a week-long vacation, but it's possible to pop down from LA just for the day. You can visit Old Town, have lunch, spend a few hours on a hop on, hop off trolley tour, take a boat tour or visit Balboa Park or Coronado Island (both stops on the trolley tour), or take a segway tour and have dinner in the Gas Lamp District and make it back to LA in the same day. You could also spend the whole day doing one thing, like visiting the famous San Diego Zoo and Wild Animal Park or SeaWorld. If you're fond of gaming, the San Diego area also has a number of top-rated Indian Casinos. This favorite getaway for Angelenos is not exactly a road trip, although you have to start out by road. You'll need a ferry to get to Catalina Island—or a helicopter. Its major city, Avalon, once known as ​a sleepy place with not much to do, now offers all kinds of pampering and adventure experiences, from beach-side massages to zip-lining down a mountain. If you want to get further away from it all, Twin Harbors, at the other end of the island, lacks most of the mod cons of Avalon but is a popular camping and hiking destination.